Oh Mighty Isis! is the battle cry for the crime-fighting and all-around nicest super-hero on television. Recalling those words will transform high school science teacher Andrea Thomas (played by JoAnna Cameron) into the Goddess Isis. This transformation enables her to control the elements of the sky and earth in order to fight crime and defend those who need it most. The cast includes fellow teacher Rick Mason (played by Brian Cutler), the principal of Larkspur High School, Dr. Barnes (played by Albert Reed), and student Cindy Lee (played by Joanna Pang). The stories in the series are built around the lives of those at the high school and usually the students' exploits lead them into dangerous situations where they ultimately need to be rescued. 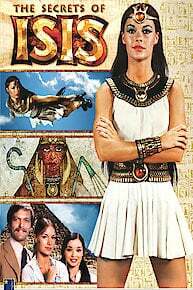 Thanks to her secret identity, Andrea (as Isis) is on hand to become whatever is necessary to save the day. Isis provides law enforcement with essential assistance by subduing the criminals with her special powers until justice is served. Detective Andrea and her students are hard on the case to prove Rick's innocence. Rick is framed for stealing a machine that controls the weather. A student of Chinese heritage is embarrassed of her father's old-fashioned ways. A member of the cheerleading squad pays a hefty price for taking the answers to an upcoming chemistry exam. In an attempt to make friends, a new student goes overboard playing practical jokes. A girl learns a hard lesson after ignoring warnings about the dangers of hitchhiking. After a boy loses his vision in a horseback riding accident, Isis gives him the courage to get back in the saddle. The competition in a model airplane building contest becomes dangerous and Isis must fly to the rescue. The powers of Isis are called upon when a young couple becomes stranded on a coral reef while scuba diving. When a girl attempts to become president of the Auto Club, her opposition turns to tricks on the racetrack. When a girl with low self-esteem is caught in a storm, Isis and a group of others, go to the rescue, showing her they care. On a visit to a local ghost town, Isis and a student encounter a group of runaway robbers. A group of students decides to steal the mascot of a rival school and blame it on the ?new kid.? While on an expedition with the Science Club, Andrea turns into Isis to save her students from an angered gorilla. A boy desperate to make friends offers a local 'tough guy? his father's gun. Isis answers a boy's questions about Big Foot, while saving the life of a very large man in the forest. A young boy learns about the circle of life when his dog, Lucky, is washed away at sea. When a runaway schoolboy finds himself face to face with a bear in the forest, Isis teaches him a lesson in responsibility. When Andrea's ?circle guard? device is stolen, Isis' strength is put to the test. When a local man is blamed for a jewelry robbery he didn't commit, Isis uses her powers to bring the true culprit to light. Isis must save a young girl from car thieves after she enters a deserted scrap yard on a dare. Following the disappearance of several local residents, Isis investigates whether UFOs are invading the mountains. The Secrets of Isis is currently available to watch and stream on Vivendi Entertainment. You can also buy, rent The Secrets of Isis on demand at Amazon online.